Most versions of D&D provide XP values for monsters, usually awarded for defeating the monsters in combat. The Third Edition (and Pathfinder) manuals also give explicit prices in gold pieces for every enchanted item. Here is an idea for modifying how advancement is handled using those numbers. XP value specified per monster is converted into GP. This is the value of the monster’s treasure (and equipment). XP is given for GP spent, as I have been doing in my Vaults of Pahvelorn game. Additionally, magic items can be purchased as is commonly expected (I think) in many Third Edition games. In a game like this, I still wouldn’t make magic item shops common. Instead, I would put together some sort of system to rate sellers of enchanted items (cunning folk, wizards, specialist merchants, demonic patrons, and so forth). The rating could either be a flat GP threshold (this NPC can sell magic items of up to 1000 GP value) or it could be something like an inventory saving throw (this wizard has a stock number of 11 — roll 1d20 against that target number, modified by desired magic item level). This is somewhat similar to an idea I had for rating sages, which I should probably also write a post about. This creates a motivation to quest for NPCs that are better able to provide powerful items. Particular famous items of power might be the purview of specific individuals. The entire advancement system could even be replaced by item acquisition, for a slightly lower power game. So, for example, fighters wouldn’t ever get attack bonuses, they would just get more powerful weapons. Wizards wouldn’t prepare spells, they would buy (or create) scrolls and other enchanted devices. The interesting aspect of this proposal is that it maintains most of the expectations of the 3E/Pathfinder advancement system (assuming that standard class progression is also maintained) while only modifying the specific action incentive. The standard benefits of XP for GP are preserved (rewarding clever planning as opposed to straightforward combat). Obviously, this system would result in a setting with more common magic, but that’s not necessarily a bad thing. This entry was posted in Rules and tagged advancement, Pathfinder on April 3, 2013 by Necropraxis. I have been dipping into some Call of Cthulhu and Warhammer FRP texts recently, and this has gotten me thinking about skill-based (as opposed to class-based) systems. Back forever ago, I participated in a game called Blackwater Falls that started as D&D but was converted partway through to a fantasy White Wolf hack (which, at the time, seemed like the cutting edge of RPG design). The basic idea of the old White Wolf system was that the chance of succeeding at a given action was derived from the combination of an inherent quality (an attribute, such as dexterity or appearance) and a learned quality (an ability, such as archery or medicine). Each of those stats were rated from 1 to 5, and contributed to a dice pool. So, shooting an arrow would be a dexterity + archery action. Assume a character had a dexterity of 2 and an archery of 3. In this case, 5d10 would be rolled, and the number of successes (dice results above some value, based on the situation) would determine the outcome. Too many dice and too much counting, but I still think the direct combination of inherent and learned qualities is an interesting and intuitively appealing approach. Some versions of D&D have something similar in the division between ability score modifiers and THAC0 or attack bonus increases, but the system is not generalized or particularly elegant. The Blackwater Falls system used that basic paradigm, but combined it with the simplicity of roll-under ability checks. Inherent + learned was a number from 1 to 10, and then the roll-under check was done with a single d10. Quick and elegant; I still like it. I don’t remember exactly how we did advancement anymore, but I think it was close to unmodified White Wolf. Each kind of stat had an advancement cost (inherent stats cost more to advance than learned stats) and XP was spent directly on improvement. This is okay, but seems less impressive in retrospect. To refine this system, consider combining the core of the above paradigm with a roll to advance system (this is inspired by BRP or Call of Cthulhu). Inherent and learned stats would each be rated from 0 to 50, thus resulting in a combined range of 0 to 100. Don’t worry about how starting inherent stats are determined for now; it could be by rolling, arrangement of an array, or something else. Also don’t worry about how skills are selected. Just assume that starting characters have their collection of inherent stats like strength and a small number of skills. The exact list of stats is also not important right now. Here is how action resolution works. Let’s look at dexterity and archery again. Say our character has a 25 dexterity and a 21 archery. The archery check number is 46. You could use percentile roll under for this, but simplifying by rounding down and using a single d10 decreases the number of required operations during play. So the target number becomes 4. Roll 1d10, 4 or less is a success. Now for advancement. At the end of any session, each player picks one inherent stat (such as dexterity) and one learned stat (such as archery) that they used during the session, and rolls for advancement. However, the roll in this case is above instead of below (so that it becomes progressively harder to improve stats as expertise is gained). Following the example, the target number is 47 or higher. Percentile dice are rolled twice, once for the inherent stat involved and once for the learned stat. Any success increments the stat by 1. Pre-calculating the threshold number (inherent + learned) for each learned stat would make the action resolution process extra streamlined, and would be low cost since the numbers change infrequently. Increases to inherent stats are limited by starting point. Not everyone can be Einstein or Arnold just by experience or trying really hard (though everyone can improve and it is the rare person that gets within spitting distance of their true potential). To reflect this, I would say that inherent abilities can be increased up to 10 points beyond the starting score. Thus, a character that begins with 21 strength can increase it to 31 through play. This is also important to prevent acquired blandness, as all PCs converge towards being good at everything (a common downside of overly general systems). Learned stats are also limited by their associated inherent stat. So archery can never be higher than dexterity (or whatever). Since all action checks are a combination of inherent and learned, going from 36 all the way to 46 through advancement is still useful, despite the rounding down for the 1d10 check, because when combined with different learned stats the percentile part might still make a difference. Since the action check is done with 1d10 and the advancement check is done with percentile dice, not all advances will lead to a direct effect on play. That’s okay; they still bring you closer to a real improvement, and since the advancement checks happen every session, I think that is okay. The percentile number ends up being somewhat like the Hackmaster idea of fractional ability scores, but much more elegant. I’m not sure how long it would take characters to top out using this system. Given a large set of skills (and the increasingly slow chance of advancement), I could see this being functionally unbounded. If not, some more thought would need to be given to other forms of advancement. I see learned stats for this system being significantly different than most of the skill-based systems I have encountered, which tend to be concerned primarily with modelling all of the things that define a complete individual. 4 points in drive, 3 points in literary analysis, 3 points in dancing, etc. That’s not the model for learned stats here. Instead, they would represent only adventuring skills (as appropriate to the genre in question). So a fighter-type might have pole-arms 20 and crossbows 17. The level of specificity is still somewhat up in the air. A specific stat for derringers is probably overkill, but an all in one melee weapon skill is probably too general. The traditional thief abilities are at about the right level of granularity (pick locks, hide in shadows, etc). For magic-user types, an individual spell or ritual is a separate stat, and could be used at will assuming all the requirements are met (along with some danger of mishap or chance of corruption). Learned stats will require some more explicit guidelines and examples, but I think the basic intent is clear. Since all actions are based on inherent + learned, there would no suggestion that, for example, only thieves could sneak. Everyone could roll dexterity (or whatever) +0, even if they don’t have any appropriate learned stats, such as hide in shadows or stealth. The same is true for any relatively mundane action, like climbing. 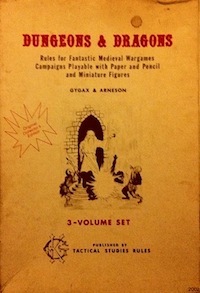 Rather than an make an advancement roll, a player may choose to acquire a new learned stat, assuming that they have performed some action that allows getting a new skill to make sense in the fiction. For example, rescuing a martial arts master might allow a character to learn some kind of combat skill. Finding a tome of forbidden lore might allow the learning of a spell. The way I am thinking about this now, getting a new learned stat should not require a roll; it happens with no chance of failure. A newly acquired learned stat would begin with 1d10 points. Another option would be to require the player to roll under twice the associated inherent stat to start off the learned stat, but I think that might needlessly slow down advancement (the fictional justification, along with giving up an advancement roll, seems like it would be cost enough). This entry was posted in Rules and tagged advancement on March 20, 2013 by Necropraxis.